The poet James Whitcomb Riley was born in Greenfield, Indiana on October 7, 1849. To give you an idea how long ago that was, he was about 12 years old when the U.S. Civil War started. Thomas Edison and Alexander Graham Bell were both born around the same time. At the time of his death on July 22, 1916, James Whitcomb Riley was a beloved figure across the country, but especially so in Indiana. Riley was well known for writing in dialect. A dialect is a particular form of a language that is special to a specific region, in this case Indiana. It is similar to what we would call an accent today. When a person read his poetry, it was like listening to a neighbor and people really liked that. Many of his poems were funny. People really liked that too. Riley traveled the country giving live shows reading his poetry. In his time, he was a rock star! Riley's death was such news it made front page headlines in major newspapers all across the country. There is an old scrapbook of the events that followed his death at The James Whitcomb Riley Home & Museum. You can look at this scrapbook online. It has all kinds of old newspaper clippings in it. One of the headlines about his funeral says, "35,000 People Pass Casket of Indiana Poet". That is a lot of people! During Riley's life people did not have radios in their homes yet. To listen to music or readings they used phonographs. In Riley's day you had to hand crank a machine to listen to a recording. Very early ones recorded onto cylinders. Later ones recorded onto flat discs, like a CD, only larger. Today you can play a digital file of an audiobook on your phone or computer. In 1912 Riley recorded poetry readings for the Victor Talking Machine Company on one of those flat discs so that people could listen at home - an old time audiobook. We have these old Riley Recordings at IndyPL in our digital collection. Open the James Whitcomb Riley Recordings to listen to the man himself reading his own poetry. Lucky for you they are in a digital file now! Mr. Riley's most famous poems for children were and still are, "Raggedy Man," "The Little Orphant Annie," "When the Frost is on the Punkin," and "The Old Swimmin’ Hole." You can read them right now in these free eBooks from IUPUI. I recommend the deliciously scary "The Little Orphant Annie." Annie is a great storyteller! She tells the story of why you better mind your parents because "The gobble-uns'll git you ef you don't watch out!" To read it click on the first book below, Riley Child Rhymes, and then click on page 23. Two Famous Portraits were painted of him by these two artists - T. C. Steele and John Singer Sargent. U.S. History in Context: James Whitcomb Riley is a database you can use in any IndyPL Library Branch or at home. Login using your IndyPL library card number. Indiana Memory: James Whitcomb Riley is a database you can use in any IndyPL Library Branch or at home. Login using your IndyPL library card number. 10. His book Rhymes of Childhood was published in 1912. Today, over 100 years later, you can easily find his book at the library or go to an online bookstore and find it for sale as a print book or an e-book. There are not very many books that are still printed from that long ago! 9. In the late 1890s Riley encouraged the African American poet Paul Laurence Dunbar. He wrote Dunbar a letter of recommendation that helped get Dunbar's work published. 8. When Riley died, the President of the United states, Woodrow Wilson, and the Vice-President of the United States, Thomas Riley Marshall (who was from Columbia City, Indiana), both sent messages of condolence to his family. The Governor of Indiana allowed Riley to be laid in state at The Indiana Statehouse Rotunda so that people could come pay their respects. Until that time, only Abraham Lincoln had been honored in that way. 7. Greenfield, IN, his birthplace, and Indianapolis, IN, his home for over 20 years, fought over where Riley should be buried. Over Riley's Dead Body: Indy's Weirdest Civic Fight. Indianapolis won. He is buried at Crown Hill Cemetery in a tomb at the top of a hill, the highest point in Indianapolis. Section 61, Lot 1. 6. Both Riley's boyhood home in Greenfield, IN and his adult home in Indianapolis, IN are museums and on the National Register of Historic Places. 5. The James Whitcomb Riley Hospital for Children was created and named in his honor in 1924. In 1955 the hospital added Camp Riley, a camp for youth with disabilities. 4. In 1940, the U.S. 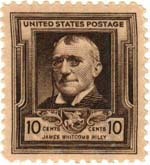 Postal Service issued a 10-cent stamp honoring Riley. 3. A cargo ship, the SS James Whitcomb Riley, was commissioned in 1942 during World War II. 2. 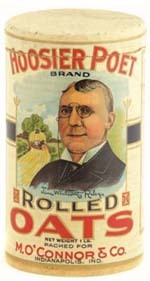 There used to be a Hoosier Poet Brand of coffee, oatmeal, vegetables, cigars and more.